Basil is a beautiful, tasty green herb. You can grew it year-round indoors or you can find it in the herb section of the grocery store. I like using it in sauces as well as on pizza or pasta and it's even good tossed into your salad or on your roasted vegetables. It's most often featured in Italian cooking. Today I'll share a wonderfully easy recipe that is suitable as an appetizer or snack or even as a delicious side to a salad or soup. Though tomatoes are not in season here in Indiana, you can find some nice ones in the store - especially campari tomatoes which is what I used. It is a spin on the traditional caprese salad of tomato, basil, and mozzarella. Arrange slice of bread on a broiler-safe baking sheet. Drizzle or brush lightly with olive oil. 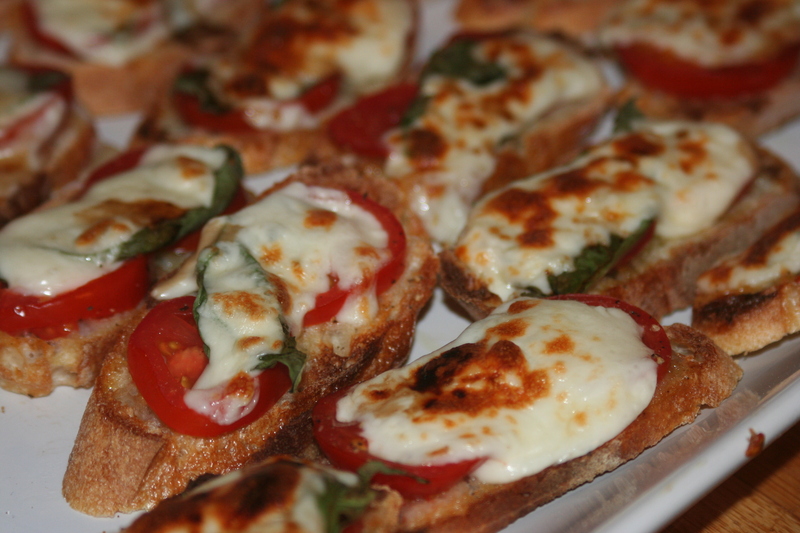 Top top with a slice or two of tomato, salt & pepper, fresh basil, and sliced mozzarella. Drizzle balsamic vinegar over top. Place under the broiler until cheese is melted and lightly browned - it will only take a few minutes so watch it. Serve immediately - although they are still good when they have cooled.